DIXFIELD — Joshua L. Hussey, 48, shot himself in the head early Saturday in Dixfield as a Maine State Police tactical team tried to arrest him at his mother’s home, according to authorities. He was in critical condition Saturday evening at Central Maine Medical Center. Hussey, of Greene and Mexico, was wanted on domestic violence terrorizing charges and for violating a protection from abuse order. 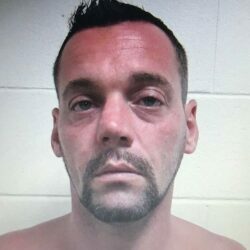 Because of his violent criminal history, “a decision was made to conduct a felony arrest at night for the safety of the officers,” Maine Department of Public Safety spokesman Stephen McCausland said. The idea was to catch Hussey by surprise to minimize danger. No shots were fired by police, McCausland said. Hussey was taken to Rumford Hospital, then transferred to Central Maine Medical Center in Lewiston. McCausland did not know whether Hussey’s mother was home during the arrest. On March 7, state police had asked for help in finding Hussey, saying they believed he was in Androscoggin or Oxford county. Because of threats from Hussey reported by his family and friends, police considered him armed and dangerous.